Source: Key to Toronto, February 1982. Walking into the Country Style Hungarian Restaurant along Bloor Street in the Annex is more than dining on central European cuisine served on checkered tablecloths. The venerable eatery stands as one of the last links to the strip’s past, before Hungarian businesses, butchers, and restaurants gave way to cheap sushi joints and falafel spots. The influx of refugees following the uprising against Hungary’s communist government in 1956 built up a community that stretched into Kensington Market and Yorkville. In November 1956, shortly after the Hungarian revolution, Canada’s federal government announced that it would accept all refugee claimants, a move possibly motivated by Cold War–era one-upmanship. Around 37,000 Hungarians came to Canada, with 12,000 of them settling in Toronto. They were temporarily housed by organizations like the Salvation Army and YMCA, and in locations stretching from the CNE Coliseum to Chorley Park. Highly educated, the Hungarians made their mark by adding a touch of cosmopolitanism to a city starting to shed its staid, conservative skin. In the late 1950s and 1960s, these neighbourhoods became popular with immigrants who harboured a deep belief that the key to preserving their culture lay in the availability of schnitzels, rye bread, and rich pastries. 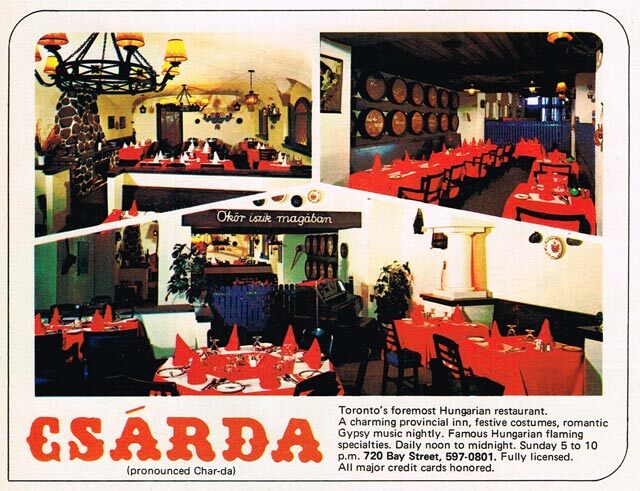 At the height of the Magyar invasion, Bloor West was a veritable Budapest of eateries, from Jack and Jill, in the old Colonnade building, and The Coffee Mill, on Yorkville, to Marika’s, Cake Master, Corona, Country Style, and the smoky, windowless Blue Danube Room. Although the quality of the food didn’t vary much from one to the next (there are only so many ways to stuff a cabbage), their respective patrons tended to be fiercely loyal. The heart of Bloor Street’s Hungarian strip, between Brunswick and Bathurst, earned several nicknames. “Wiener Schnitzel Row” was favoured by some, while others, with apologies to writer Aleksandr Solzhenitsyn, dubbed it the “Goulash Archipelago.” Beyond the émigrés, the cheap, hearty food appealed to university students on tight budgets. 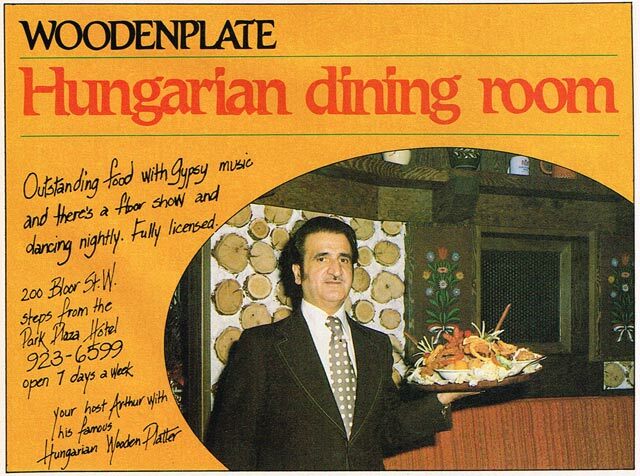 Toronto’s first Hungarian eateries opened in the mid-1950s prior to the revolution, offering a taste of middle Europe to awakening post-war tastebuds. Clientele varied by restaurant: the Coffee Mill in Yorkville attracted artisans with its sidewalk café, while spots along Bay Street like Csarda and Hungarian Village advertised in tourist publications. Attila’s Flaming Platter is a gourmet’s triumph … borne flaming to your table, with background music of ravishing Gypsy violins. This is a platter for two (or more, if desired), piled high with the choicest hot meats, surrounded with a selection of delicious salads in lettuce cups, surmounted by a tall spit with spirit cup (specially designed) on which tenderloin pieces and mushroom caps wrapped in bacon strips are given that incomparable flavor filip of flambe. Elements like strolling violinists became, depending on your point of view, a charmingly kitschy part of the meal, or something that sped up requests to pack up the leftovers. 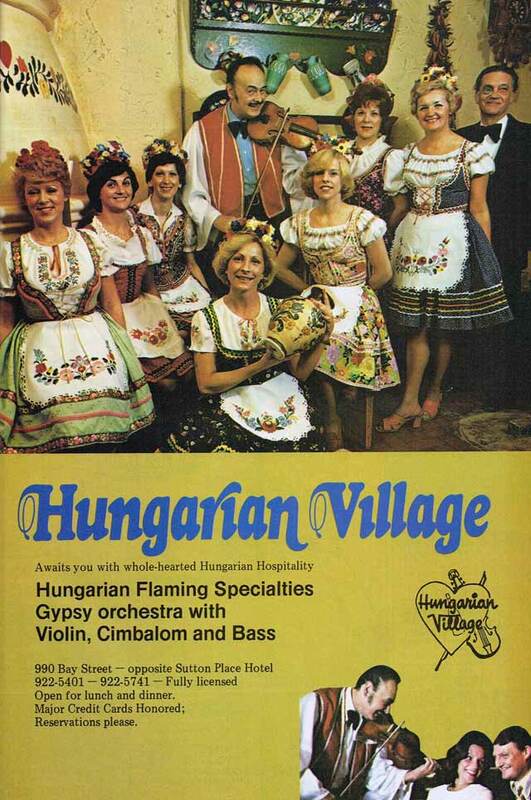 By the 1990s, the Hungarian influence faded as the second generation assimilated into the mainstream, moved away from the core, and decided not to keep businesses going. Aging clientele doomed spots like the Coffee Mill, which closed in 2014 after a half-century run. The number of restaurants along Bloor shrank, leaving Country Style as the last paprikash standing. Additional material from the October 17, 2006 edition of 24 Hours; the May 28, 1960, August 28, 2004, and October 14, 2006 editions of the Globe and Mail; and the July 17, 1976 edition of the Toronto Star.